I keep milk in a glass jug, salt in a cup by the stove, and use cloth napkins all the time, not only on special occasions. Whoa! There’s always dark chocolate in the fridge, and there are no plastic dishes in the cupboard. What next? Not only do I make pizza at home, I often make the dough, too. Well, there you have it: I’m not ‘usual’. My good friend Laura recently told me this, and she proceeded to lay out some examples. The hilarity of it was that as she was explaining things in exaggerated story-telling tones, I was not seeing them as anything but normal life. But, according to her, it’s my normal life, not the norm at large. This all started when she read my post about tying frozen bags of peas with a strip of the plastic bag. It was one (strange) thing to do it, but another all together to think to post it, apparently. Milk (part I): here in Canada, milk comes in cartons and in plastic bags. 4 litres of milk divided between 3 plain bags, in a larger outer bag. Because my household uses a lot of milk, I always have bags – not cartons – in the fridge. But as each new bag is needed, it gets emptied into a glass pitcher. I don’t like the milk to be in a plastic bag. So I pour it into a tall decanter. No big deal. What do other people do? Slide the bag of milk (yes, bag and all) into a shallow ‘milk jug’ made for these bags, and snip the upper corner off the bag for pouring. (The amount of milk in the bag is too much to be emptied into this container designed to hold the bags). Now, really, which way is more strange? Milk in a plastic bag or in a glass pitcher? This is the typical plastic milk jug, made for holding a bag of milk (milk AND bag). Milk (part II): not only do I own a milk frother, I regularly use it. It’s basically a tall stainless pot with a jug-like handle and lid with a lacy metal screen attached to a plunger: you warm milk on the stove, cover the pot and pump air into the milk to make it frothy. I make cappuccino this way, or even add the milk to hot chocolate. When I’m finished, if there’s any milk left in the pot, I put it in the fridge, pot and all. Why not? It’s just milk filled with air, so the milk will be used for coffee the next day, by which time the airy foam has collapsed into regular, cold milk. Apparently, people don’t do this. Not froth at home, nor return the milk to the fridge. You? Thoughts? Salt: I don’t use fancy salt. Sometimes it’s coarse, sometimes not. Usually I buy sea salt, but nothing really out of the ordinary. But I keep some in a little cup next to the stove for when I want to quickly and easily add a pinch to something I’m cooking, or a salad I’m mixing, or whenever else I might need a pinch of salt, and not a measured amount. Laura says cooking shows do this and magazines tell you to do this, but most people don’t. I’m so used to it, that it now seems like such a time waster to reach in the cabinet, pour some in my palm, pinch out what I need, and dump the rest. Why would you do all that? 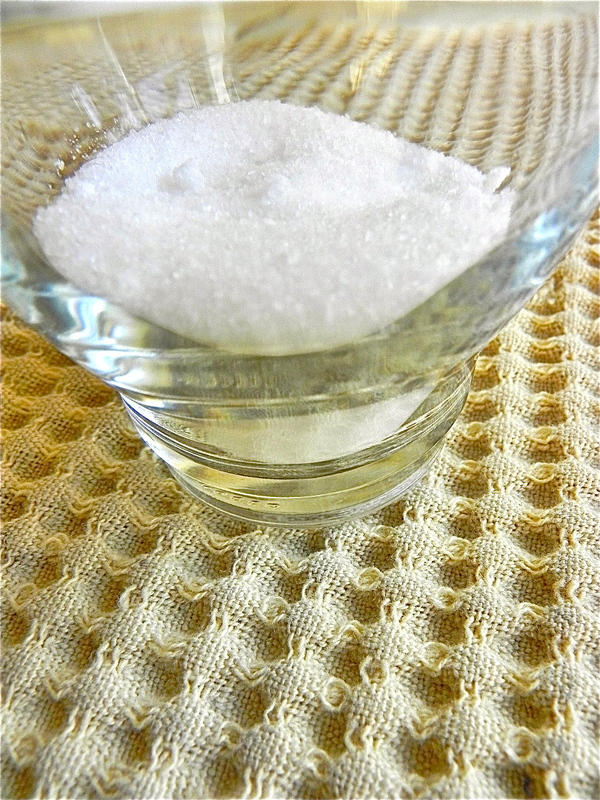 Pour a little salt in a small dish, keep it on the counter, and refresh it often. (Trash the last dregs, wash the container, start again.) Much easier, no? 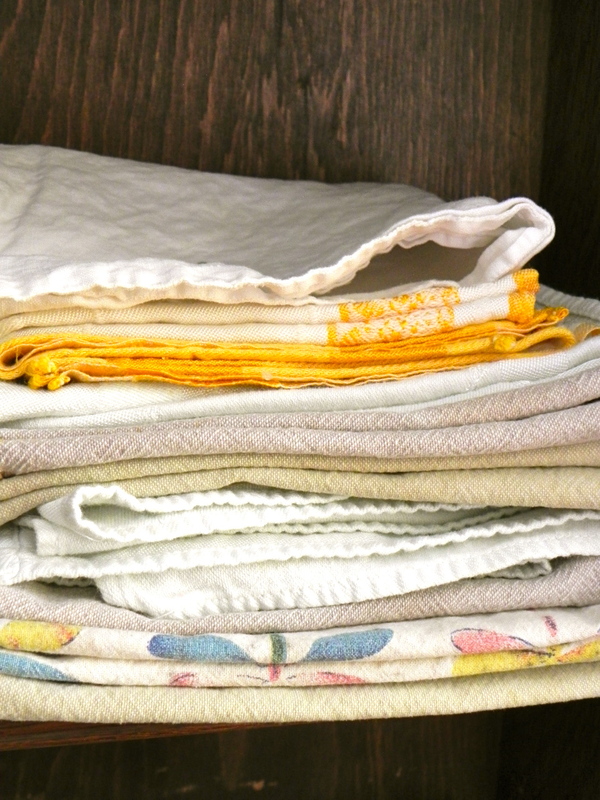 Cloth napkins: I use them day-in and day-out. I do have nicer ones for special occasions, but if you open the cabinet next to the table you’ll find a stack of ordinary ones we always use. Cloth napkins are not my way of making every meal special, or some other nice idea like that. I just prefer to wash and reuse them than buy cheap, scratchy, easy-to-tear, non-absorbent paper ones. What’s wrong with that? I might have a few paper ones in the drawer, pushed back behind the corkscrew and nut cracker, but those would have come into the house along with some falafels we bought at the take-out counter and couldn’t bring ourselves to throw out after the sandwiches were gone. The wastefulness! Dark Chocolate: Always in the fridge, because we buy it like a staple… milk, bread, eggs, dark chocolate. But we never eat it in one go. And, I guess, that’s the unusual part. After lunch, or mid-afternoon I have a piece, or two. Maybe we offer it as dessert to guests some nights. My husband often has a piece with coffee, around 8:30pm. End of story. No Plastic Dishes: That pretty much sums it up. Ok, I’ll explain. Yes, I have a one-year old and an almost three-year old, but no, I do not have bright, cheery, plastic bowls, cups and plates. No rubbery spoons or chubby-handled forks. 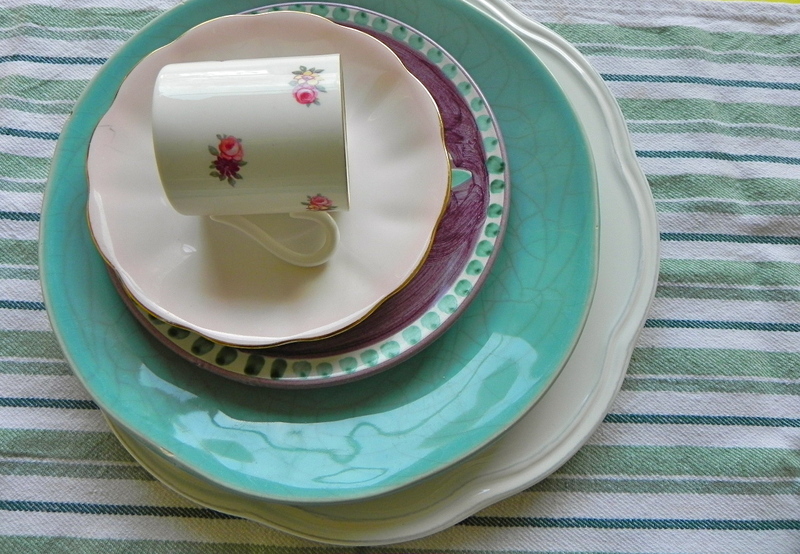 Everyone uses our regular dishes and cutlery, whether matching or not, adult or child. Even outside. The one exception is the water cup my littlest uses. It is a plastic “sippy” cup that has a screw-on top and a stopper inside the mouthpiece, so she doesn’t soak herself with every drink; she’s not quite ready for a regular mug yet. So there it is; a handful of examples of my ordinary kitchen habits and behaviour. What do you think, are they so unusual? Please (please, please) comment so we can discuss. Haha this was delightful! We have the same kind of milk frother for lattes, hot chocolate, etc. Isn’t it the best?! But I usually heat the milk over the stove in the little cup, so I don’t save leftover milk in the fridge. Thanks for this; I love to have comments and feedback, especially if you understand what I’m getting at. To my favourite not-usual friend. You forgot to mention that your fridge usually has several small beautiful china tiny dishes or saucers filled with random leftovers…like 3 tbsps of rice, or a spoonful of beans. I did forget about that… is it strange, too? Salt – I have a lovely two part wooden container so I can keep both table and coarse salt at the ready. Dishes-95% china. A few miscellaneous bowls and yes, I do have fun, seasonal plastic dishes for the grandkids. Did buy the eldest a place setting of Fiesta ware in her favorite color, orange, when she was three and will do so for the next two. Milk – transfers to a glass container at half a gallon. Both my girls do this also. It gets yucky inside the original container if not drunk up in a few days. Dark Chocolate- of course a small piece of the bar (never in the fridge though, this is Alaska where the butter on the counter barely gets spreadable) after lunch or dinner. My dad in his later years would have coffee and a piece of chocolate for breakfast. Thanks for such a thorough reply. And I’m glad to know you do some of the same things I do and your friends think them odd, as mine do. Keep it up! Yes, my dear friend. Keeping a tbsp or two of rice is not usual! Don’t ever change though! You turn these little bowls of mouthfuls into delicious meals. Somehow! Yes, my dear friend. Keeping a tbsp or two of rice is not usual! Don’t ever change though! You turn these little bowls of mouthfuls into delicious meals. Somehow! !